“Whilst today is yet another setback, it is by no means the end,” one of the Hooded men said. 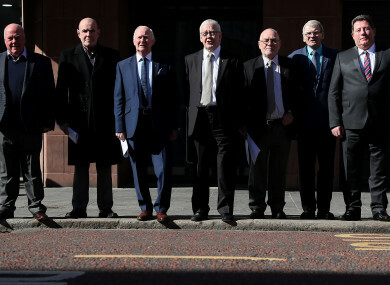 Seven of the so-called 'Hooded men', July 2018. THE EUROPEAN COURT of Human Rights has rejected a request by a group known as the ‘Hooded men’ to review their claims that they were tortured by British soldiers in the 1970s. The European Court of Human Rights had previously rejected the request to review taken by the Irish government against the UK – groups representing the men had asked the Irish government to appeal that decision. Ireland made the revision request in the case on the grounds that new evidence had emerged, which showed, in particular, that the effects of the ill-treatment had been long-term and severe. In a ruling handed down today, the Court found that the Irish government “had not demonstrated the existence of facts that were unknown to the court at the time or which would have had a decisive influence on the original judgment”. There was therefore no justification to revise the judgment, it said. The revision request was dismissed by six votes to one by a Chamber. The judge elected in respect of Ireland issued a dissenting opinion. Although the European Commission of Human Rights found in 1976 that the ‘five techniques’ used on the men amounted to torture, the European Court of Human Rights reversed that finding two years later. By 13 votes to 4, and without hearing evidence from the men, it found that although the events “undoubtedly amounted to inhuman and degrading treatment… they did not occasion suffering of the particular intensity and cruelty implied by the word ‘torture’”. Whilst today is yet another setback, it is by no means the end. We have already received a legal ruling confirming our treatment was torture. It is disappointing that the European Court missed an opportunity to correct such an unjust ruling, however we now eagerly await the Court of Appeal’s decision, and seeing those responsible held accountable. A statement from the legal teams representing the men was issued in response to the decision, saying that this case “was always highly supercharged”. It is concerning that the Court has allowed, for a second time, the injustice that is the first ruling to go unscathed. For too long the first ruling has been used for a number of international states as a battering ram against human rights protections, when utilising torturous techniques. Noting the judgement given today, Tánaiste and Minister for Foreign Affairs and Trade Simon Coveney said that it was important to note that the men’s case “was founded on a wish to ensure that the brutal treatment they suffered could never be referred to as anything short of torture, in order to maintain human rights standards for all”. “It is important to say that nothing in the panel decision today or the Court’s ruling on 20 March last altered the Court’s original 1978 judgment that the victims in the case suffered inhuman and degrading treatment, in breach of Article 3 of the Convention. “The men have campaigned with dignity and determination for many years for the appalling suffering they endured in 1971 to be confirmed as torture. The Government shares that view, which is why it sought the revision of the judgment in 2014. Members of Coveney’s Department are to meet with the men and their legal representatives to brief them in full on the outcome. Email “European Court of Human Rights rejects request to review its 'Hooded men' ruling”. Feedback on “European Court of Human Rights rejects request to review its 'Hooded men' ruling”.